What if I told you that half the world’s wind power might be taken off the grid over the next several years? If you cared about climate change, you’d be apoplectic—and rightfully so. At a time when we’re struggling to increase our generation of zero-carbon electricity as fast as possible, recovering from this kind of setback would take years that we just don’t have. Thankfully, we aren’t really facing a loss of half the world’s wind energy. But the world might lose even more zero-carbon power if something isn’t done to stop nuclear plant closures right here in the United States. And because so many of these nuclear plants are facing real financial challenges due to cheap natural gas, more than half of the country’s nuclear power could go offline at some point in the near future. Regardless of what technology is producing it, the threat of losing this much zero-carbon energy should make climate advocates apoplectic. 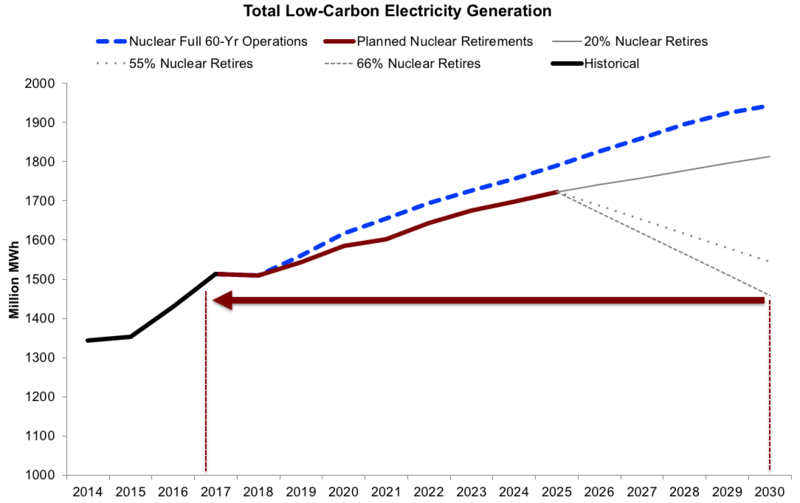 Ideally, we’d want nuclear reactors to generate zero-carbon power throughout a 60-year lifespan, or even longer if they’re able to continue operating safely. But fierce competition from natural gas (along with the failure of state and federal policies to adequately reward the climate benefits of nuclear power) is causing plants to retire much sooner than that. The U.S. has lost six nuclear reactors since 2013. An additional six reactor closures were narrowly averted, thanks to swift action by New York and Illinois to protect their respective fleets. 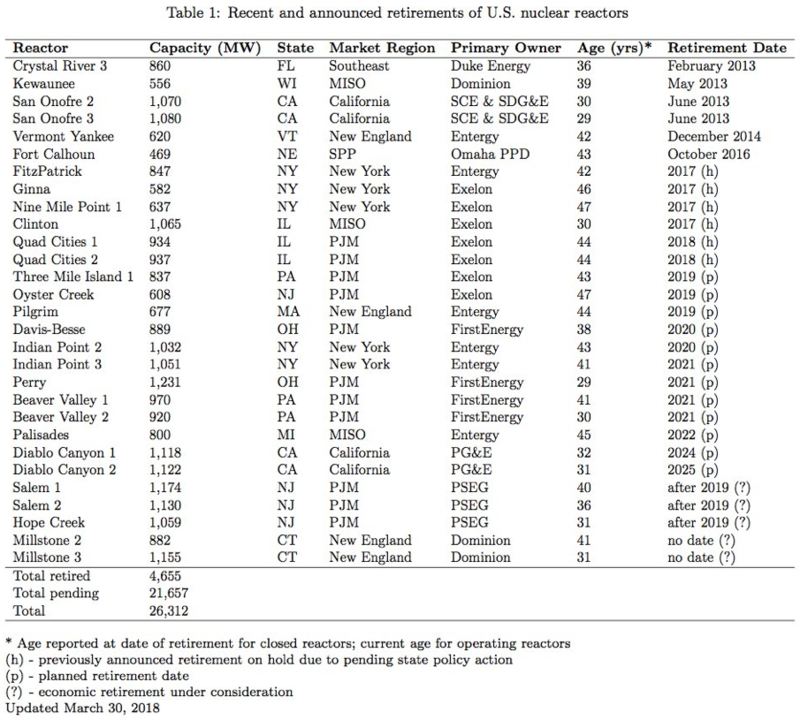 Still, roughly 1/5 of the nation’s nuclear fleet is scheduled for early retirement. And that’s likely just the tip of the iceberg. Bloomberg New Energy Finance (BNEF) estimates that 55% of the U.S. fleet is operating at a loss in current market conditions and at risk of premature closure, while research from MIT suggests that number could be as high as 66%. Even if just 20% is retired early, it’s still a huge loss of clean energy and a blow to climate efforts. Each and every scenario for achieving America’s long-term climate goals calls for a massive increase in zero-carbon power, as we transition more of our energy needs toward electricity while simultaneously eliminating fossil fuel use. 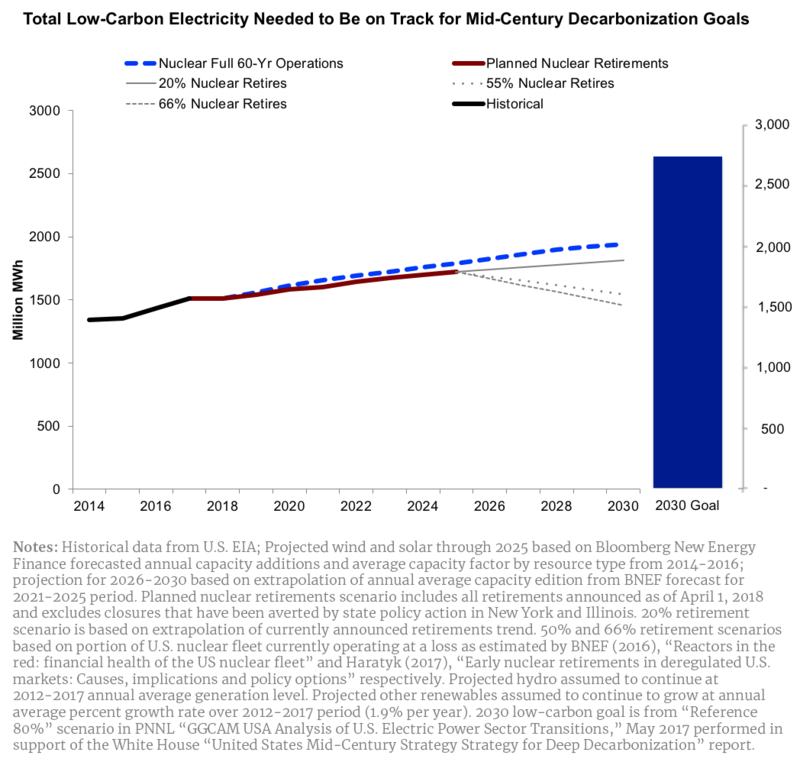 According to analysis behind the Obama Administration’s “Mid-Century Strategy for Deep Decarbonization,” the U.S. electricity sector will need to produce roughly 2,750 million MWh of zero-carbon electricity annually by 2030 to stay on track toward 2050 emissions targets. In the chart below, we’ve combined generation from nuclear energy with the latest growth projections for renewables from BNEF. 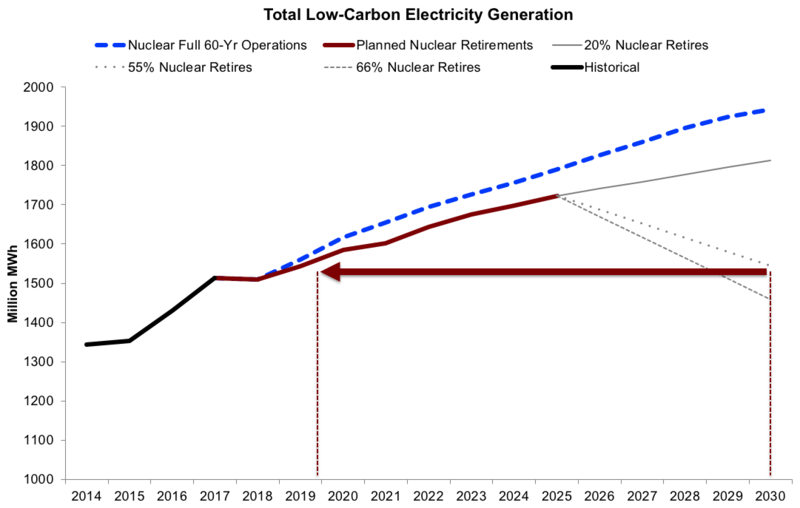 Even in the best case scenario, where nuclear plants run for a full 60 years, our total zero-carbon generation in 2030 still doesn’t hit the mark. If this tells us anything, it’s that we must accelerate the pace of new clean energy deployment, and keep all of our existing clean energy resources online. As nuclear plants get shut down, new renewables will have to pay-off that zero-carbon debt before they actually start increasing our totals again. Some argue that continuing to operate nuclear power plants is more expensive than building new renewable energy, so we should let these large sources of zero-carbon electricity retire and just build more wind or solar. The reality is more complex. First, in nearly all cases, keeping a nuclear power plant operating requires less public policy support than it does to build new wind or solar. 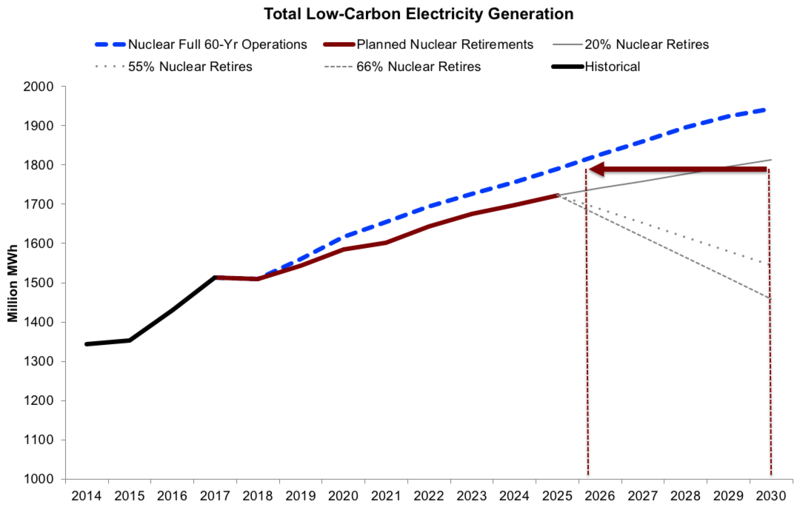 Second, much of the zero-carbon generation we lose from nuclear retirements will invariably be replaced by fossil fuels like natural gas, and emissions will rise as a result. And finally, even if we were able to replace retired nuclear solely with renewables, it’s still a setback in the climate fight. The only way we win is if we grow the amount of zero-carbon energy we’re producing. As nuclear plants get shut down, new renewables will have to pay-off that zero-carbon debt before they actually start increasing our totals again. That’s a big waste of renewable energy and, most importantly, time. In fact, allowing nuclear plants to retire puts us years behind schedule in terms of scaling-up our zero-carbon power. Even if we limit the loss of nuclear generation between now and 2030 to just 20%, that’s a setback of 4.5 years’ worth of clean energy growth. If we lose all the at-risk plants in the BNEF scenario (55% of the fleet), clean energy progress will be set back by eleven years. In other words, all renewable energy growth after 2018 would be wasted replacing nuclear, erasing all zero-carbon energy progress over this period. And if we allow the worst-case scenario of 66% of at-risk plants to retire, we set our efforts back by a full thirteen years. At the end of the day, two things really matter in the fight against climate change: growing our total zero-carbon energy production so we can shift away from fossil fuels, and doing it quickly. If we allow today’s zero-carbon nuclear power to disappear from the grid, much of the growth in renewable power that we’re working so hard to accelerate will be wasted, and precious years will be lost in the process. State and federal policy can promote new clean energy and support the clean generation we already have. In fact, if we want to get anywhere close to our climate goals, our policies absolutely must take both into account.